It is recommended that you do not rub the transplanted area to avoid any damage. You can shampoo once or twice a day. While doing so, use a sponge to roll over the grafted area. It must be soaked in water as well as shampoo. The rolling motion over the recipient area is applied to squeeze the shampoo mixture from the sponge. A surgical scrub brush is also used and you can get it from your surgeon. These brushes do not contain soap which makes them ideal for use on the grafted areas. Be careful not to move the brush/ sponge in a back and forth motion. This can lead to pulling out the graft. You can use this and the side to side motion over the donor area as there is no graft that you need to protect. After surgery, the blood must be present over the scalp. On your first day after surgery, you can wash the donor area comparatively forcefully. After washing the blood, keep the scalp clean. You can use the back and forth or the side to side motion to clean the donor area. The chances of damage are minimum as no graft is present there. Try not to stand directly below the shower to rinse off the shampoo. 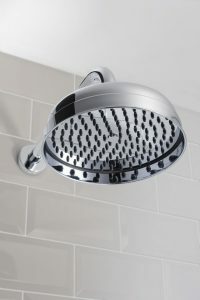 In fact, instead of spraying the shower water, use your hand between the shower and your head and let the water flow. Rinse off the shampoo in this way and use a clean towel to pat dry the scalp. Staying in the water for a long time can cause the graft to swell. The area rises above the skin surface looking like white bumps. Though it isn’t dangerous, you need to reduce the soaking time span. Not to worry about the raised bumps as they will disappear when the graft will settle down on scalp’s drying. 6. How to deal with larger size crust? The possible incident that occurs on the first night of transplant is the enlarging of crust. The bleeding makes the crust appear larger than the graft. In such cases, you need to use a moist cotton swab and get the crust off through the rolling motion. Simply rolling instead of wiping would do as the cotton fibers will slowly pull off the crust pieces. Without forcing the grafts out, gently roll the cotton over the area repeatedly until the crust disappears. The graft is implanted in the scalp by fifth post-op day if you keep the area crust free. In a case otherwise, where you have failed to wash vigorously, the crust remains for more than five days. Scrubbing or forcefully pulling off the remaining crust after five days can lead to graft displacement or damage. Hair transplantation techniques have seen a great many advances in the past 15 years.. Hair transplantation has evolved from punchgrafts to strip-surgery and in the past 15 years the ever more popular Follicular Unit Extraction (FUE). The major dis-advantage with strip-surgery has been and is the linear scar in the donor-area that becomes visible if the hair is not kept long enough. The FUE technique has gain more popularity as it does not leave a linear scar in the donor-area. In many cases FUE does not leave a visible scar in the donor-area while in some cases the donor-area is hardly visible. FUE hair transplant is a time consuming procedure and involves a higher degree of participation of the surgeon which makes it more expensive but also means a much higher rate of patient satisfaction. 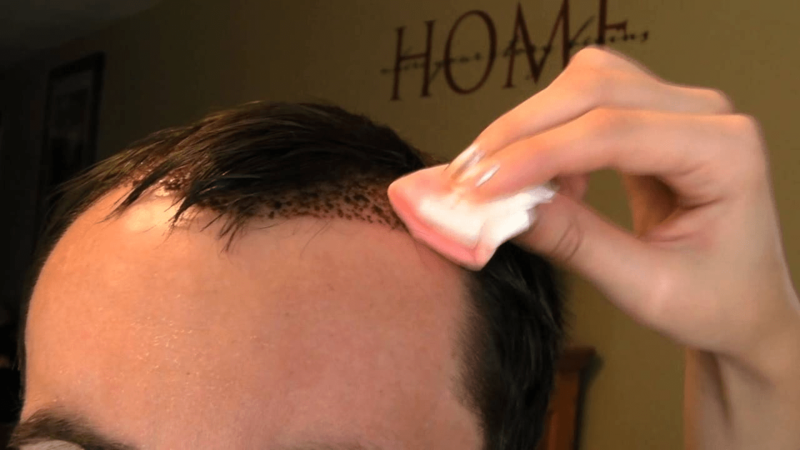 The FUE technique is different than the FUT technique in only the method of extraction. The method of implantation used in FUE is the same as FUT. 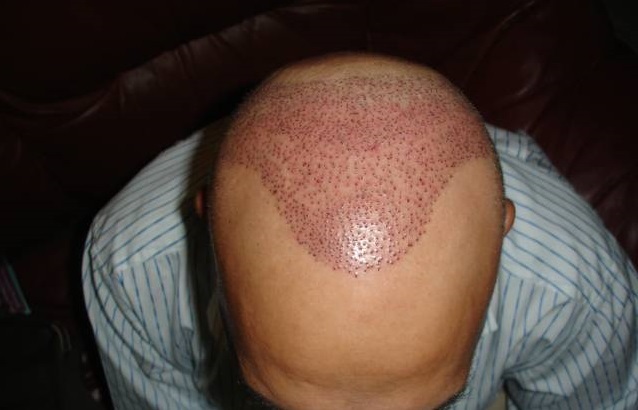 Scalp- and body-hair can be used as a donor-hair in FUE hair transplant. However. Most commonly the sides and back of the head is used as it has the best growth prospects. This extraction is done using special micro-punches to loosen the grafts which are then extracted using forceps. Each grafts may contain 1-4 hairs while in some cases even more hairs can be found in one grafts. The average number of hairs in each grafts varies greatly according to ethnicity. Caucasians tend to have finer hair but more hairs per grafts while Asians have thicker hair with fewer hairs per graft. In most cases patients would have an average of 1.7-2.3 hairs in one grafts. Hardly visible scarring in the donor-area. Grafts/hairs placed in natural direction where the surgeon takes into account the natural direction of hair in each little area that he treating. 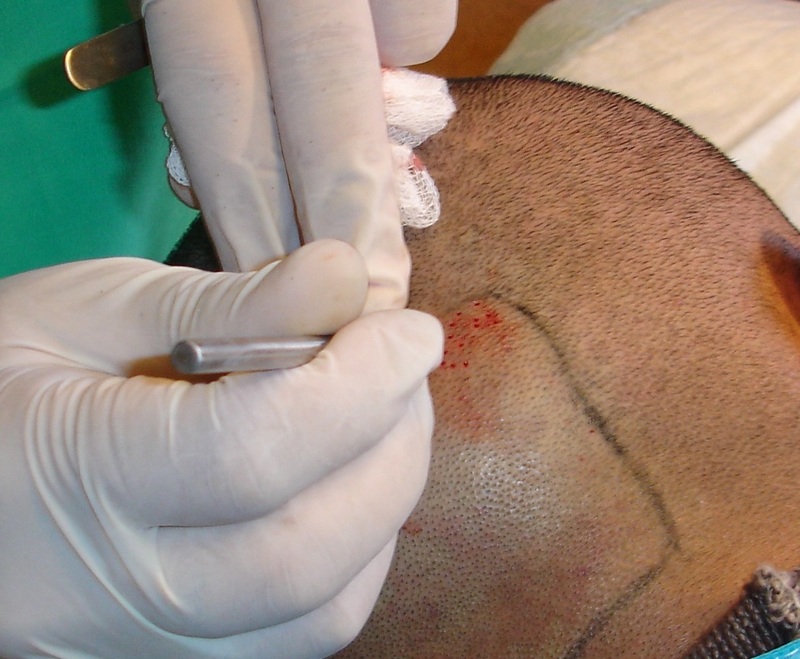 A recipient-area that shows no sign of a surgery even if the patient opts to go for a trimmed or bald head at a later stage. A comfortable surgery and smooth post-surgery experience. No long term complications or issues. My Hair Clinic has 12 years of experience in this field and all doctors and technicians working at My Hair Clinic has been individually trained or vetted by the founding surgeon, Dr Hussain. Get started with an Online Consultation today! Find out if you are eligible for hair transplant surgery by going through our free consultation and we will provide you answers to your questions form the comfort of your own home! What to expect after FUE Hair Transplantation?